Race Starts 11.00 (please register no later than 10:40). Start from the Stickle Barn and run straight out of the back to start the grinding ascent to Stickle Tarn. We’re using the traditional track to get you up to Stickle Tarn, meaning great foot placements all the way, a little 5m scramble on route just before you cross the Stickle Tarn Beck on the fantastic stepping stones (watch your footing here or you may get an unexpected quick cool down) and then more ‘scrambley’ type ground to make the half way point at Stickle Tarn, where you are afforded the most spectacular views of Pavey Ark, one of Langdales premier climbing crags and the home of the brilliant ‘Jacks Rake’. At this midway point we will have a manned checkpoint for your safety, before the continued ascent to the summit of Harrison Stickle. After slogging the lower section, which is a well laid footpath, made by NT Wardens, workers and volunteers, you move into ‘real mountain’ terrain. Only the fittest will be able to keep running the upper section as the track turns to a more typical Lakeland trod up the righthand side of Harrison Stickle, sandwiched on the other side by the sweeping rock of Pavey Ark. Sections of this path are still semi laid, but not in the way the lower track was. For sure your legs and lungs will be burning and screaming at you to stop, but of course you must tell your mind and body to shut up and put up and just keep on pushing for that summit glory. Three quarters of the way up the second half and the gradient finally starts to ease giving most the chance to run a short distance before once more ascent will grind you to a walk for the summit, your certain glory and relief as no more do you have to endure the pain! 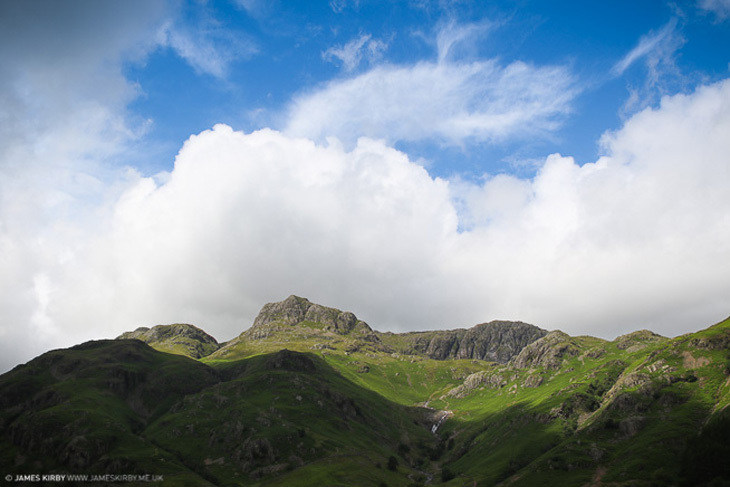 We encourage you to take up the challenge in true form and fight your way to the summit achieving burning legs, screaming lungs, a pounding head and huge cheers at the summit to get your own PB on summiting this amazing pike of the Langdale Valley. You can descend at your leisure. Price: £12 in advance, £16 on the day. Remember all proceeds from the event go to our nominated charities. Fell and Mountain Runners, Fast Walkers and Fast Nordic Walkers. ** Please be aware this is a fell running event and accesses the high fells, depending on the weather we may well impose a shortened course, finishing at Stickle Tarn. This is a minimum kit list for the GDOC in Langdale Uphill Race. Mountain/Trail running shoes and/or Walking Boots. ** please contact the RD if you belief you are capable of running/walking in less substantial footwear. Survival Bag – Only during ‘Bad Weather’. Hill food – gels, bars, snacks. Race Vest/Small Pack or Bumbag must be worn to carry race kit in. There may be random checks at the start of the race to ensure competitors have the minimum kit requirement. Safety Notice: The Race Director reserves the right to ask for additional warm clothing (e.g. tights or long sleeve base layer etc) to be worn or carried dependent on the weather conditions on race day, so please come prepared. You will be informed of this at registration. A Manned Checkpoint/Feed Station st the mid way section. All finishers and retirees must report back to the Race Director/Timekeeper at the Event Centre. This is a vitally important safety system. THIS IS THE GOLDEN RULE. Competitors must have good experience of fell running and /or fell walking. By entering this race they accept the risks that are inherent from fell running/walking. Withdrawl pre-race – we cannot offer a refund for any reason. However, rest assured the proceeds from your entry fee will be going to multiple good causes as this is a volunteer led event. Dogs: Well behaved dogs are welcome, but please be aware of other racers and fell users around you. If you dog creates a mess around Stickle Barn, bag it and BIN IT, don’t leave it hanging on the nearest fence or bramble bush. If its creates a mess in the fells on the footpath, move it to one side, the slugs will do the rest. Don’ leave it in the middle of the path for another competitor to collect on their shoe, as we doubt they will appreciate it! Please make sure your dig stays on its lead.